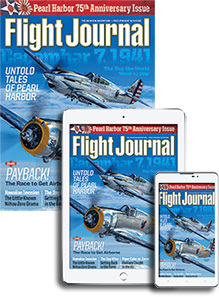 Flight Journal is like no other magazine in the world as it puts you directly in the cockpit with gripping first-person accounts of flights and historic combat missions. We cover the world of aviation from its simple beginnings to it no-holds-barred future. With killer photojournalism, Flight Journal captures what it's like to pilot aircraft that inspires fear and awe, from the historic P-51 Mustang to today's stealth fighters. Preferred Automatic Renewal Program: We will continue to renew your Air Age Media subscription at the rate then in effect, without interruption, unless you tell us to stop. At the end of your subscription you will receive a notice prior to your credit card being charged. You may cancel at any time during your subscription and receive a full refund on all unmailed issues by visiting the Online Customer Service Center. If there is ever a problem with the card you provide, we will simply bill you instead.